Remove the core from each tomato with a paring knife and make a slit in the shape of an ‘x’ in the bottom. Blanch in boiling water for 10 seconds or until the skin comes off. Immediately cool in an ice water bath. Peel the skins off. Quarter the tomatoes and blend. Bring the mix to the boil. Strain the mix through a tea towel, catching the water that escapes. Let cool. Add some basil leaves and blend. Mix together the ricotta cheese, parmesan and egg yolk. Season with salt and pepper. Stuff each flower and twist the top to close. Place the flowers on a baking rack placed inside a tray. Fill the tray half with boiling water. Bake in a 150 degree oven for 15 - 20 minutes. Do not let the flowers colour. 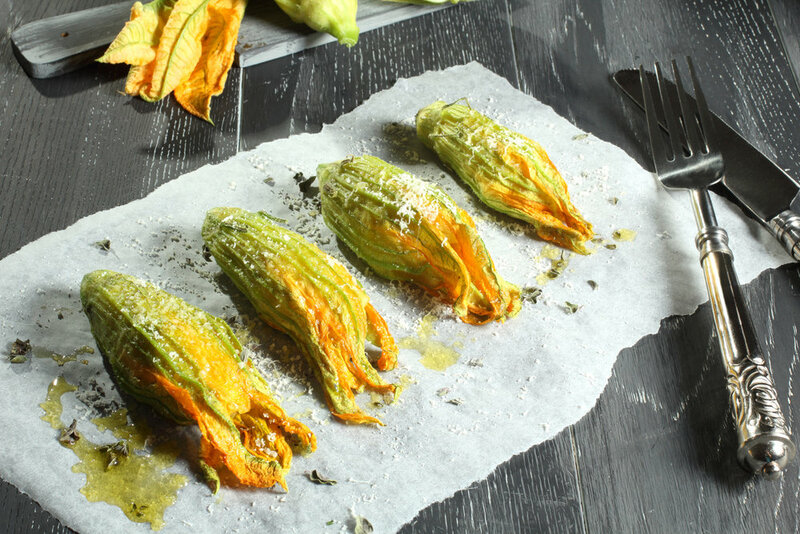 Place a piece of parmiggiano shavings on each flower and grill for 5 minutes or just until the cheese has melted.